Tuesday - better than Monday. This is progress, people. There wasn't much to be accomplished today so we got a checkmark in the only box we had - exchanging the already opened (before we bought it) can of formula for a new one. Also stopped by the library, hectic I know, but we were thwarted at Starbucks. Nowhere to sit. Tomorrow we return to Lil' Bean n' Green. After our "adventure" (read the outing above), we returned home to focus on food, fun and naps. Lunch was great - fresh avocado, cheese and some bread - at least at first. Oliver fed most of it to himself. Dad was very proud (of both Oliver and himself), until Oliver got a bit stuck and puked it all up. Then it was time for naps. After nap for Oliver (Dad used this time to be productive and actually clean the house!) we played catch. Oliver thought it was great fun and quickly learned to throw the ball back to Daddy. Much squealing ensued. So much squealing that, after catching some of it on videotape, Dad tried to dial things down a bit with some quiet storytime. 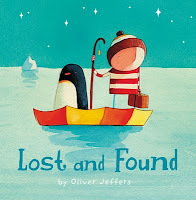 Oliver was content to listen to one of his new favourite books Lost and Found. The little guy got hungry for dinner a bit earlier than usual, likely because lunch ended up on the floor, and down his front, and on Daddy's pants. Despite the lunchtime fiasco, Dad was bold. Tossing caution to the wind, Dad slipped beef onto the menu again. After a near repeat of the "return of the lunch", Oliver kept it down and actually asked for more! Dinner was then a great success - cheese, carrots, parsnip and beef. We'll make him an Albertan yet. When Mommy got home from work, Oliver was very excited to see her, so much so that his desire to sleep quickly fell down his priority list. Instead he wanted to show Mommy his wild bouncing and attempts to crawl. This demonstration continued through bathtime, into his room, and into his crib - way past bedtime. Well, he's down, for now at least. Let's keep the streak alive, little man, and see you in the morning (hopefully)!